I used to roll my eyes at people who said the nursery was one of the best parts about pregnancy. 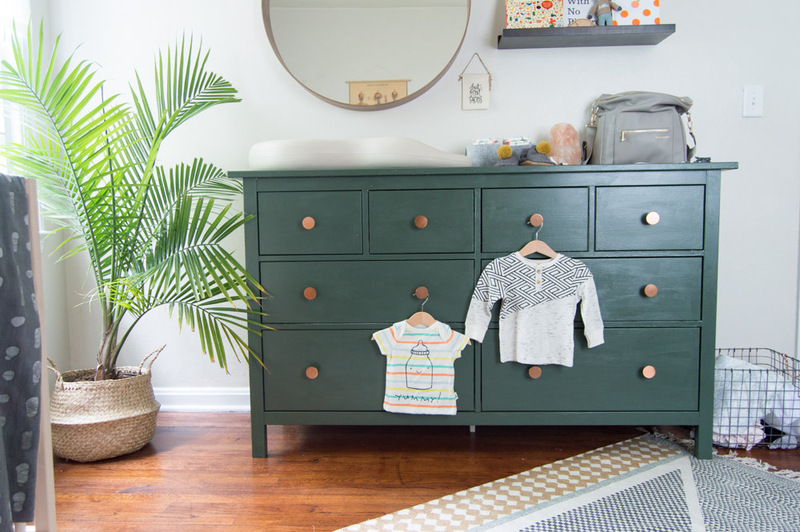 While I’m still pregnant writing this, I can’t say what the best part has been, but I will agree with the statement that it is an exciting time to decorate a new space in your house. Our house is very tiny, which I have no problem with, and majority of our time spent in our tiny house, I adore. Our house also isn’t our house; we rent. There’s always such a struggle with renting and designing. Everything you’d really really want to do, you don’t want to invest a lot of time or money into. Sometimes it’s a fun challenge, but for me it’s usually just a lack of passion. Once our nursery was complete, I was actually pretty proud with how it turned out, and it was a room that I could see myself relaxing in. I didn’t really have a clear idea of how the nursery was going to go, but I knew a few things I wanted, and once we put those things in to place, other pieces started to come together quickly. 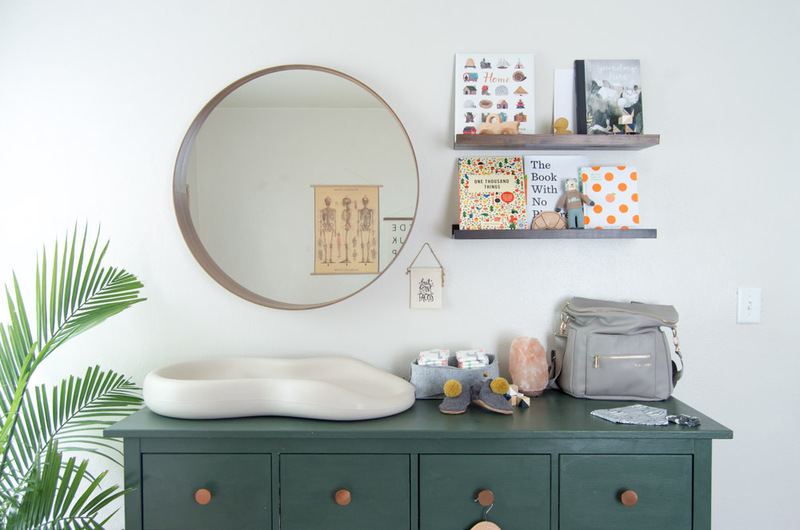 The main thing is I knew I wanted a changing table painted emerald green. Once we found out we were having a boy, I chose a deeper green color. Honestly, when I saw this kitchen tour is when I knew I had found the color! I wasn’t sure what kind of changing table we’d get, but I knew I wanted it to be a dresser. I don’t know why people even bother with getting anything besides a dresser as a changing table. We decided on this dresser because of the amount of storage we’d get out of it. This will actually be the only storage space we’ll have dedicated to our son. Being in a tiny old rental, there isn’t a lot of closet space. We have a total of 3.5 closets in this house. One stores our clothes, another stores cleaning supplies/household tools, the half closet has yearly decorations/extra linens/puzzles, and the one in his room is the catch all for any other storage items that aren’t daily used but needs to be kept. Needless to say, hopefully when people say babies don’t need that much stuff, they’re right because we don’t have space for stuff. The knobs you can find here. I’m kind of a sucker for a unique knob. I think if we were having a girl, they’d be marble knobs like these? I was a little undecided on what was to go in that corner, so for now… a plant, a majestic plant. Literally, its name is Majesty; it was $15 at Ikea. Our cat Noodle has not being treating it as its name portrays, and you can see she’s been trimming the leaves with her teeth. I doubt this will stay here long; I’m thinking maybe a diaper pail or maybe the air purifier we’ve been using in our room will replace it? The changing pad was also one of the very first things I knew I wanted. I’m not one to be changing babies in my every day life, but when I stumbled upon the Keekaroo, it made sense to me. Again, not one to be changing a lot of diapers currently, so maybe it won’t make sense? As for the mirror, I have always wanted this mirror but never wanted to purchase it just for myself. Perfect timing to get something I really wanted because you know that thing is going to make it out of his room at some point. The next purchase wasn’t a planned item, but so far I’ve been so happy with it: the glider. I honestly went back and forth so many times on whether to get a more expensive heavy duty chair or the wooden cheap (but stylish) chair from Ikea. We were walking around Babies R Us getting ideas for our registry, and I sat in this chair. I said that if I decided I wanted a more durable chair that this one would be it. We had come back for something else the week after, and it was on sale. That’s when I made up my mind, we’re going with a chair chair. I would like to breastfeed, and this just seems more comfortable to be in hours at a time. So far myself, my gentleband, and the cat have used this thing non stop. I’m relaxing in it as I type while the cat is curled up behind me. Whether or not I sit here to actually breastfeed, this thing is not a regret purchase. However, this chair did put a little damper on how I set up the room because of its size. My gentleband works from home and the original intentions were to keep a portion of this room his office space until our son actually started to sleep in here. Once the chair came we realized that was probably not going to happen and he willingly booted himself out. Maybe I’ll do a post on how creative we had to get with his new workspace? He was moved a few times, but I think we have a winning spot in this rental. When we first found out we were pregnant, and I knew we were going to do a green dresser, I saw this rug and decided to just get it. My mentality has kind of been to collect and purchase things along the way. I also wanted to make big purchases early on, while I still had a full time paying job, so we could budget easier when I took a pay cut. The crib was a simple one for me, I did know I wanted this crib. 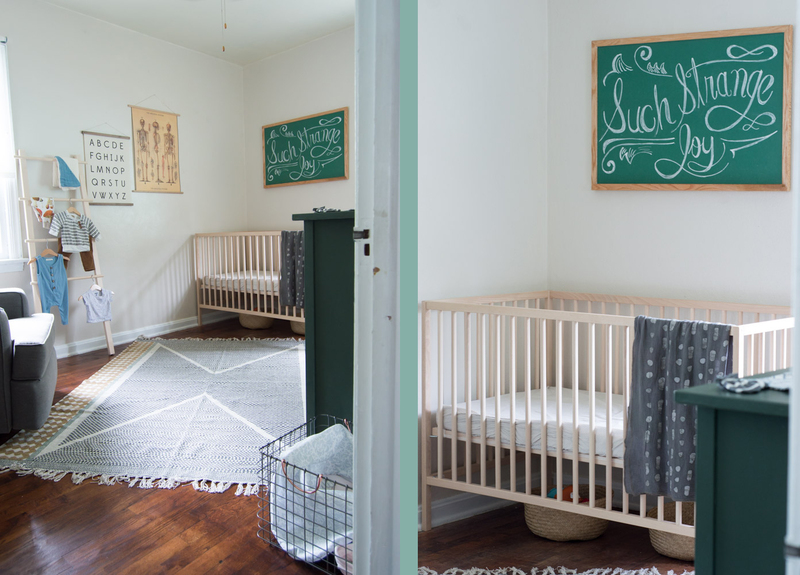 It’s such a popular crib, minimal, and cheap! Its style is super versitale and kind of goes with any style. This cheap thing I’m hoping sticks around for awhile considering it can convert into a toddler bed. So we had big furniture items all purchased and set up: dresser, crib, and glider. Now it was time to figure out what we wanted to fill in gaps. This is also the moment I decided I didn’t really want to decorate his room with a ton of animals. 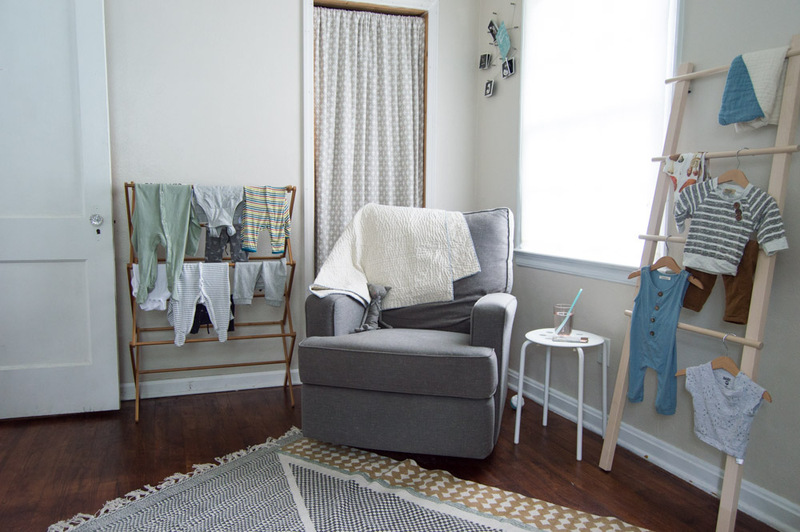 So far I could see myself using the dresser and the chair outside of the nursery, and I wanted the rest of the purchases we made to be items we could transition out into other rooms. 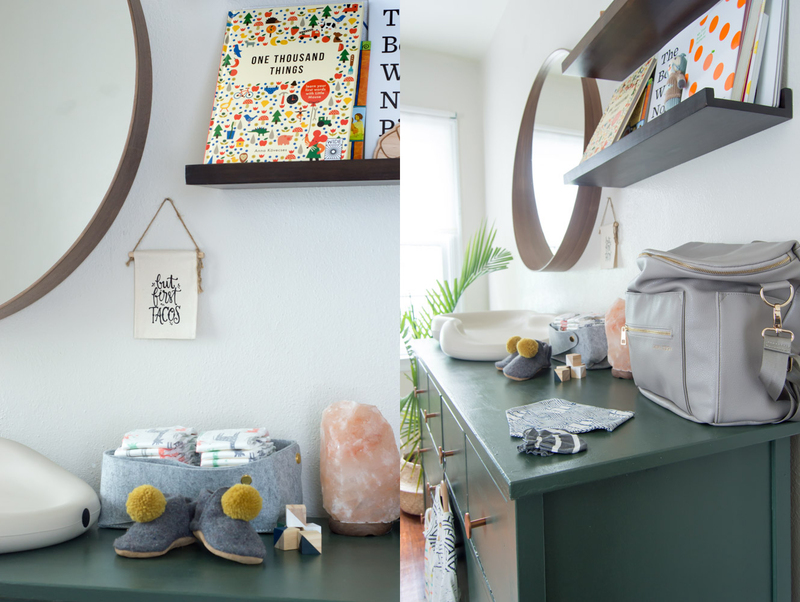 C’mon we create a nursery style to our own style when they’re first born anyways, right? It’s also the moment I realized I didn’t want to totally cover the walls with art. We had invested some money into some bigger items for him, so I wanted to wait to spend more money on a room he’d call his own when he had more of a voice and we potentially owned a house. I saw the alphabet sign from here and immediately wanted it. Once I had that, I didn’t know what else I wanted around it. Then I remembered those vintage anatomy posters in doctor’s offices. I remember I stayed in an Airbnb in Nashville one time and one of the rooms was decked out with old anatomy posters and thought it looked so cool. So to the web I went, and ended up on this site. I don’t see my print on there anymore, but they have some very cool vintage school charts. I’d love to get the mushroom one, but we’ll see if he ends up loving food diagrams as much as me. I had seen people use ladders as storage for blankets, but not many nurseries use them to hang clothes. This is just a cheap ladder from Ikea, and we’ll see the practicality of it once he’s born. For now I think it looks cute and again, he doesn’t have a closet. If we move the ladder to another area of the house later, maybe that mushroom chart will make its way to its place. 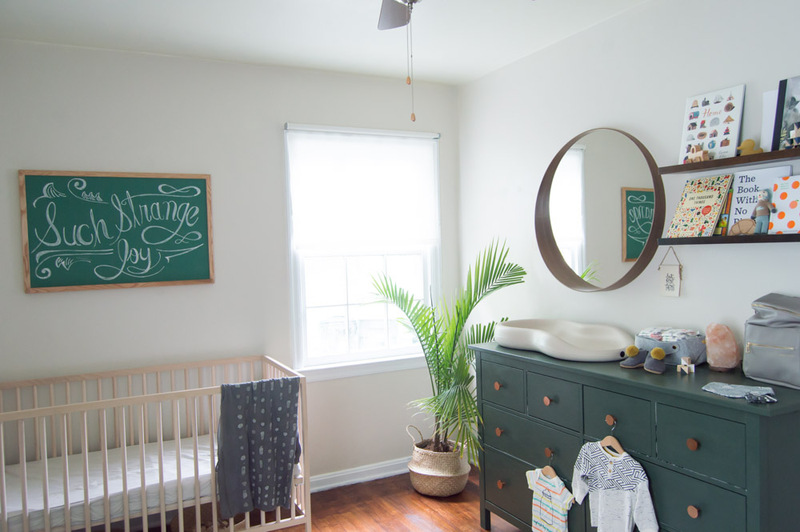 Since I had started to add in some school charts, I found the space above the crib to be a spot a green chalk board would tie in nicely together. I found the perfect one here and had our friend write the saying that kind of started this whole, pregnancy journey out in. You can read our birth announcement here and the meaning behind, “Such Strange Joy.” I also like the idea that we can use this as he grows older and practice writing or you know, scribbling, maybe eating chalk? Annnnd here’s an out take photo of Finley and I with me waiting for the gentleband to get the camera in focus. I’m sure I’ll appreciate looking at this photo later even if I don’t appreciate it that much now 🙂 I know there’s little items around the room that I didn’t link to, if there’s anything you want to know where it came from, just leave a comment and I will let you know! I didn’t want to go crazy with links as I’ve already done quite a lot.